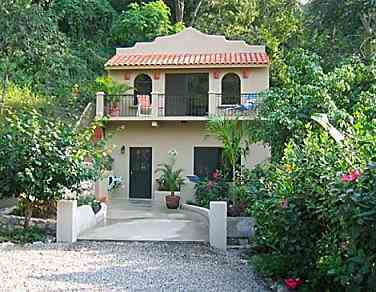 Upper and Lower Casitas from the outside. Upper Casita bedroom and bathroom. The upper Casita has a bedroom with king size bed (sleeps 2), full bath with hot water, and a comfortable sitting area and kitchenette. The kitchenette is furnished with fridge, stove, microwave, coffee maker, toaster, blender, dishes, silverware, pots, pans and bottled water. It features satellite television as well as an outdoor terrace with ocean view (J-14 on the map). 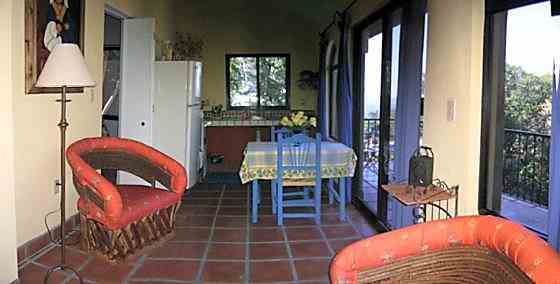 May be combined with the Lower Casita if more space is required. The contents of this site are copyright © 2006 Daniel Hallas. All Rights Reserved.